Master Builders KwaZulu-Natal: Oddly positioned and somewhat disjointed! Oddly positioned and somewhat disjointed! 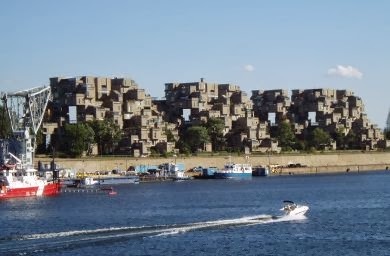 Habitat 67, is a model community and housing complex in Montreal Canada, designed by Israeli–Canadian architect Moshe Safdie. It was exspected to revolutionize affordable housing and launch a wave of prefabricated, modular development. Built as a pavilion for the World's Fair held in 1967, it is regarded as both a success and failure. The apartments look oddly positioned and disjointed, but Safdie says there's actually a purpose behind the design: Habitat 67 is made from 354 cubes, stacked so that no window faces toward another window to provide privacy. "It's unusual-looking," Safdie says, "but it's user-friendly." The development was designed to integrate the benefits of suburban homes, namely gardens, fresh air, privacy, and multilevelled environments, with the economics and density of a modern urban apartment building. It was believed to illustrate the new lifestyle people would live in increasingly crowded cities around the world. Originally financed by the federal government, it is now owned by its tenants who formed a limited partnership that purchased the building from the Canada Mortgage and Housing Corporation in 1985. Safdie himself, owns a penthouse apartment.